What’s the Dead Weight Loss of a Consumption Tax When Externalities Are Present? Or, Ironman at Political Calculations mangles Econ 101. Again. Now, the funny thing is that the graph is appropriate when no externalities exist. But the reason for imposing the tax is to internalize the negative externalities associated with consuming sugary drinks. That means that, contrary to the graph provided by Political Calculations, the marginal social benefit and marginal private benefit (i.e., demand) curves do not overlap. 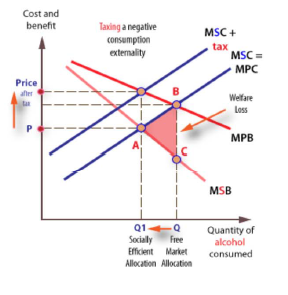 If the marginal social benefit of consuming a soda is less than that of private benefit, then one obtains the following graph (substitute “soda” for “alcohol” in the figure below). The imposed tax is assumed to fully internalize the externality. 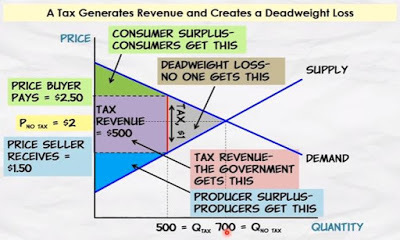 The tax incidence calculations are correct, but the dead weight loss calculation offered by Political Calculations is wrong in this context. In fact, in this case, the DWL is exactly zero. Only by assuming away the externality is the DWL calculation correct. It might be that Political Calculations believes there are no negative externalities associated with soda consumption; if so, he should mention it, given that’s a key reason the tax is there. If a deadweight loss exists, it represents the amount of economic activity that has been directly lost because of the imposition of the tax, which tells us the degree to which the city’s economy may have shrunk as a result. I don’t think I’ve ever seen such a definition of DWL. I think of DWL (in Political Calculation’s context) as the cumulation of excess social benefit over social cost, for all the foregone units of consumption arising from the tax; in his graph, he thinks it’s for units 501 to 700. So, it’s a welfare loss, expressed in dollar terms, under various assumptions regarding the nature of utility functions. This discussion exercise illustrates the adage that a (very) little knowledge is a dangerous thing. At a minimum, bloggers should complete reading an entire intro micro textbook before writing about micro. If you want to see Ironman mangle the use of economic statistics, see this post. This entry was posted on August 3, 2017 by Menzie Chinn. Personally, I think the Philadelphia government is in it strictly for the money. It’s hard to get a general tax increase enacted nowadays. So it becomes “don’t tax you, don’t tax me, tax that guy behind the tree.” The path of least resistance is to dress up a soda/beverage tax in puritanical moralizing, and in turn dress that up in “externalities”. I would hypothesize the following: if the sodas really carry the touted externalities to a degree that actually matters, then they will also shorten the lives of soda-drinkers relative to others. Even a little of that would produce a big externality benefiting pensions and Social Security. Sure, there’s the issue of disease, but most people these days die slowly and expensively whether they die early or late, so there may be little or nothing to see there. There might even be notable “savings” on people who would otherwise have lingered on for years and years in a phthistic state in the nursing home at $70K/year. So I offer a “modest proposal”. Very possibly, soda-drinking actually saves “society” big bucks rather than costing anything at all on net. If so, then surely we ought to encourage, even subsidize it (rather than raise the price of sugar artificially with the infamous tariffs and quotas, never mind retail taxes) After all, if the Almighty Dollar – externalities etc. – is what rules, then wouldn’t that even be an ethical obligation? Or not. But I find the bossy, snobbish moralizing and posturing to be more tiresome with each passing week – and I think the resentment it created was an almighty help to Donald Trump, who is also tiresome. If grasping Philadelphia – or Chicago – politicians lust for ever more money for their useless pet projects, let them raise general taxes instead of just haughtily kicking the “deplorables” around (I don’t follow this closely enough to know which crooked politician’s buddies happen to lust after a costly luxurious stadium this week. I also don’t give a stuff about stadiums and have no desire whatsoever to pay for or set foot in one.) Who knows? Maybe a transparent tax increase would get some pols voted out. What better outcome could one hope for? PaulS: Gee, why half measures. Ever read “Logan’s Run”? (Don’t watch the movie – atrocious!). Speaking of “half measures”, why stop with “sugary” drinks. Why not tax carbohydrates regardless of form since they all become “sugary” when consumed? Of course, there would have to be a strict definition of “sugary” in terms of grams of carbohydrates per standard serving. That would, of course, entail an acceptable definition of a “standard” serving. Would that be three raisins, a quarter cup, half cup, full cup? How many ounces of liquid in a “standard” serving? This could provide not only tax revenue, but create massive job opportunities for the new Overseer bureaucracy. 1. Ironman’s graph is correct. That, as I understand it, is how deadweight loss associated with a tax is presented. 2. You have not made the case for externalities, and as Ironman points out, the Philly city government explicitly precluded health benefits in its calculations. It would have been interesting to run a natural experiment, and take a sample of the city’s population and see if it affected, for example, weight, presumably the key indicator to watch. Philly government has chosen not to take that route. Given that blacks are more likely to be in lower income groups and are by definition non-white, this tax can be presumed to be targeted primarily, if not entirely, at modifying black behavior, per Menzie’s belief. The underlying assumption is that principally blacks and other predominantly low-income Philadelphians — to the extent that Menzie’s suggestion of externalities is correct — simply cannot be left to make their own food consumption choices. 4. We can calculate the propensity to shop outside the city by reference to income. Thus, if I make $24,000 disposal income, an hour of my time is worth $12 / hour. Therefore, if I am a Philly resident, but can travel to a store outside Philly in less than an hour round trip, it’s worth going if I would have paid $12 or more in soda taxes. It turns out this is not that hard to do. For example, the Philly soda tax on a Gatorade G2 Grape 8 pack is $2.40. On a twelve pack of Coke cans, it’s $2.88. So my breakeven is about 4 twelve packs if it takes an additional hour to travel to Wal-Mart or Costco outside Philly. And based on my experience, while you’re there, you’re going to buy an additional $100-150 in other goods at Wal-Mart or another $400 at Costco (how do they do it?). All that is lost economic activity to the city of Philadelphia. And the situation is actually much worse than that. In 2014, Philly implemented a $2 / pack cigarette tax on top of a $2.60 state tax. Thus, the Philly tax on a carton of cigarettes is $20. I think the larger deadweight loss will come from the travel time which Philly consumers now lose in pursuit of cheap food and tobacco. The loss to Philadelphia will be a reduction in direct retail activity, as well as associated revenues from ancillary shopping going outside the city, ie, the rest of the stuff you buy at Wal-Mart. I would not be surprised to see convenience stores take a hit. It certainly will encourage the expansion of ‘food deserts’ in low income neighborhoods. Moreover, it is reasonable to believe Philly already has a thriving black market in soda and smokes, with people going to the suburbs, buying in bulk, and selling it out of their homes or the trunks of their cars. I would guess that the black market is a key reason tax revenues on cigarettes continue to decline in Philly, and sodas will follow suit. Indeed, two products are quite complementary, and thus should strengthen the black market significantly. 5. I personally think the soda tax is likely to fail, at least when it gets to the SC. The issue is discrimination. One could tax all carbonated beverages, or all beverages with sugar. However, Philly chose a weird hybrid, notably most carbonated beverages and some beverages with sugar and most with artificial sweetener. Thus, Diet Coke is also taxed. OJ is not. Milk is not. It doesn’t appear soda water is taxed. If I’m a conservative judge, I would argue that the distinction between Diet Coke and heavily sweet Tropicana is arbitrary. You can tax bubbles, sweetener, sugar or anything sold in a bottle. But you can’t pick and choose and the notion that Philly residents should not be allowed to taste anything sweet in their drinks — or that tasting something sweet in a drink is inherently undesirable — may be well over the line of reasonable. In the end, a soda tax and cigarette taxes are about as regressive a set of a taxes as you could imagine. In large part, it taxes poor blacks to pay for parks and pre-K. And of course, revenues are falling well behind expectations, with resulting budget deficit foisted on to the general budget. The analysis of the city’s cigarette tax collections was part of the City Controller’s monthly economic report for November. The report also notes that the expected cigarette-tax-revenue shortfall is about $5 million below the School District’s own budgeted projection of about $54 million that it expected to get from the city’s cigarette tax this fiscal year. According to a state provision, if local revenues from the city’s tax do not reach $58 million, the state will cover the difference. In fact, every mayor should follow the deep wisdom of Mayor De Blasio and avoid regressive taxes by raising taxes only on the wealthy (I think that’s anyone earning more than $100,000 per year). This could be done for every pet project or budget balancing requirement and the majority of residents would approve of this approach. What could go wrong? Massachusetts is going to vote on a ballot question taxing the wealthy who makes above $1M at 4% in 2018 to fund education and infrastructure. The problem is that most people who are targeted to pay don’t have the means to travel outside the city to purchase such items as there are few public transportation options for them to get there. One of the problem with convenience stores is they sell large amount of bad food and very little fruits and vegetable is what Philly is driving at to get them of offer better food to sell, not to change their behavior. The message is getting out that drinking sugary drinks leads to obesity but the stores don’t offer alternatives. You may think SCOTUS may rule against it depending on how the case is argued before them. ??? Is that a typo? Did you mean to say “…excess social cost over social benefit”? Instead of Ironman worrying about a soda tax, perhaps he should be more concerned with why the US government heavily subsidizes high fructose producers. Wouldn’t it be more economically efficient and improve welfare if we didn’t protect big GOP donors like ADM and other high fructose producers? Or the sugar beet producers in the Dakotas? Would Ironman object to an externality tax on the production of high fructose? The DWL reflects excess private benefit, which has to be reduced, because of the negative externality. 2slugbaits: In PoliticalCalculation‘s graph, the DWL is the triangle where consumption is below optimal level defined by private marginal benefit and private marginal cost; the tax has driven a wedge so Ironman believes there are foregone units of soda consumption that had marginal benefit above marginal cost. Now, in reality, if there is a negative consumption externality, that’s not true (as in the second graph). Soft drinks may not create a negative externality taken in moderation, although, perhaps, they’re best taken sparingly, like fatty foods, salt, cakes, pies, candy, etc.. Alcohol likely doesn’t create a negative externality in moderation (you don’t get drunk on a glass of wine, for example). Of course, the point of smoking marijuana is to get high, and it doesn’t take much, which is why it should be illegal. Education in nutrition may be more appropriate than taxing soda drinks. It would be nice for Menzie to actually check what the tax is about before making these silly claims. The Philadelphia Beverage Tax taxes diet, zero calorie, no sugar soft drinks just the same as regular soft drinks. The tax is not about externalities–it’s about revenues. Ironman has done a service by explaining to people how taxes create deadweight losses. He explained that correctly and there was no reason for him to complicate the explanation for his readers by considering the effect of externalities, since the tax is not about externalities. Why is Menzie always hating on Ironman? Rick Stryker: See this article regarding the original basis for the bill (as opposed to what eventually worked). Just an FYI Prof Chinn, I don’t believe the second link in your comment is functioning correctly. New reader, very much enjoy reading these entries and comments. xRunningBear: Thanks, link fixed; it’s here too. i guess in ironman’s world, previous history does not count. the original argument for the tax was about externalities. if the third attempt uses a different argument to accomplish the goal, does that mean the original arguments had no merit? how was this topic chosen to begin with? ironman even linked to the article menzie linked to. did ironman even read his own link? sloppy. or intentionally dishonest on his part. I don’t know that increased soda taxes have ever been empirically linked to lower weight or better health. Steven Kopits: Hmm. I wonder if I could say: “I don’t know that increased cigarette taxes have ever been empirically linked to lower weight or better health.” There was once a time when people were convinced cigarettes were good for you — like a little radium. Well, guess we’ll find out. So Chris Christie should drink more Coca Cola??? Really? This is your pithy comeback? Sheldon Cooper would be proud. Cigarettes are not comparable to soft drinks. In the absence of cigarettes, lung cancer is exceedingly rare, and the linkage between smoking and lung cancer has been known since at least the 1950s. My grandfather and great aunt both died of lung cancer, both were heavy smokers, and no one in the family was in any doubt that smoking was the cause. My grandfather died in 1959, now almost 60 years ago. The history of sodas is quite different and long precedes the obesity epidemic. Coca Cola hit the market and 1886 and Pepsi in 1893, that is, now more than 125 years ago. By contrast, the obesity epidemic in the US really started in the 1970s, and therefore we may ask what was unusual about this period. Now, sugar–as well as salt–feature prominently among the ingredients of all these and similar brands. But sugar is by no means limited to sodas. Not only were we eating higher calorie foods pushed by TV advertisements, we were sitting on the couch while doing so, again, from the ’70s. More calories in, fewer calories out. Like the tobacco companies, the processed food companies have an incentive to create addictive behavior in their consumers, not because they want to create obesity (just as tobacco companies do not want to cause cancer), but because they want to sell more product. I imagine this is the stuff of conspiracy theory, but there is no doubt that the economic incentive is present, and I think it likely that processed food companies made some significant progress on hooking their customers. What are all those additives after all? And what do they do? Do they make you want to eat more Nacho Doritos? They sure seem to. Artificial sweeteners operate under the assumption that your stomach can be fooled in thinking you consumed calories because your mouth tasted something sweet. Now, what if your body is smarter than that and has a real, not perception-based, feedback loop? What if your mouth likes it sweet, but your stomach comes to dissociate sweetness from calories? Maybe the taste of sweetness is simply discounted by your body, such that it continues to look for more calories even after, say, a diet soda. I have no idea whether this is true, but I would not be even a bit surprised if artificial sweeteners are ultimately linked to obesity, paradoxical as this may seem. Now, to return to cigarettes versus soda. In the matter of lung cancer, cigarettes were uniquely implicated with a very long record of fatalities. The linkage was widely known and extends back more than half a century. The only way to consume tar and nicotine was cigarettes. You could not get it from, say, eating cake. By contrast, we have many sources of calories, even if we limit the category to just sugar. Sodas are just one source of sugar, and not all sodas have sugar at all. Therefore, a soda tax is really a stab in the dark hoping to hit something. If it’s a miss, then in the case of Philadelphia, you will have made the lowest income strata worse off by reducing their purchasing power, by compelling them to shop outside the city, and by creating black markets. Personally, I would have set up two studies to assess the impact of a soda tax. 1. Take the weight of students at a school inside and outside the city limits, before and after the soda tax. Actually, not that hard to do. 2. Set up a epidemiological study of the eating habits and weight of, say, 200 representative Philly households, pre and post. Let’s see what they eat, and how the tax changes their habits. Those two studies would be a good start. So, let me say that I am not against a soda tax in all cases, but I am against taxes based on fashion of whatever sort. If you have convincing data — or are setting up a study to at least try to obtain data — that’s good. On the other hand, I am not fan of random taxes imposed based upon little more than the prejudices of lawmakers — and that seems to be the case in Philadelphia. I am inclined to see the issue in both racial and ideological terms. Philly mayor Jim Kenny came to office in late 2015 on a left populist platform very similar to that of NY’s Bill DeBlasio. He wanted to extend the nanny state, including free pre-K and no doubt a soda tax. Behind all this, however, is the racial politics of big cities. Since 1970, cities like Philly, Detroit, and Baltimore have seen white flight due to elevated crime rates and high taxes. Tax rates in these cities are no longer competitive as it is, and therefore governments are hard pressed to raise property tax and other rates for new spending programs. As a consequence, incremental taxes may be increasingly foisting onto typically lower income black populations. That’s exactly what the soda tax does. It hurts those who consumer the most packaged beverages and lack a vehicle to drive 15 minutes to suburban super stores and lack the cash to buy in bulk. The affected will be disproportionately poor blacks. You pity people by ridiculing their blog posts? Rick Stryker: Just because I pity somebody doesn’t mean that I don’t tell them the truth. And how have I ridiculed Ironman‘s post? I just pointed out a misleading aspect of the argument. That’s ridicule? Rick Stryker: Again, how is this hate? This is merely pointing out errors. Aren’t we supposed to do this in intellectual discourse? They changed the argument from healthy benefits to funding Pre-K school which translate to broad support. I hear this all the time when state legalized lottery, they say it is for education (an example) and that have people buy more to support education. All externalities are FAKE including this one. Steven Kopits is correct. Taxes on sugar drinks would be regressive. Taxes on tobacco are regressive. To remind, tobacco is the most deadly, socio-economically destructive popular recreational drug in human history. The negative externalities are well known. If there such a thing as a ‘gateway drug’ (and that can be debated), it is likely tobacco. Folks of higher socio-economic status have been quitting tobacco in droves and folks of lower socio-economic continue to use tobacco. Then there is alcohol, the subject of Menzie’s second graph. It ranks just behind tobacco for its destructive powers. It likely ranks #1 for the negative impact on other parties. Do we use Pigouvian taxes to discourage tobacco and alcohol use or should we put tobacco and alcohol users in jail or should we allow citizens to torture and kill the families of tobacco and alcohol users who hurt their loved ones? The social costs of alcohol are much greater than tobacco. And, illegal drug’s social costs are greater than alcohol. Society should provide free rehabilitation services, along with greater education. Social costs include lost productivity, traffic & work accidents, health problems & drug treatment, mental illness, unemployment, crime, domestic violence, child abuse, and other social services. Moreover, U.S. demand for drugs made foreign criminal cartels powerful. When you legalize something, you get more of it. High taxes can generate a growing black market. “For a growing number of American policy makers, politicians and activists, the best answer to the spiraling violence in Mexico is to legalize the marijuana that, they argue, fuels the country’s vicious cartels and smugglers. Legalization would move that trade into the open market, driving down the price…there’s no reason the cartels couldn’t enter the legal market for the sale of marijuana, as organized crime groups did in the United States after the repeal of Prohibition. Marijuana makes up 60 percent of the cartels’ profits, that still leaves another 40 percent, which includes the sale of methamphetamine, cocaine, and brown-powder and black-tar heroin. Cartels derive a growing slice of their income from other illegal activities. Some experts on organized crime in Latin America, like Edgardo Buscaglia, say that cartels earn just half their income from drugs. Indeed, in recent years cartels have used an extensive portfolio of rackets and scams to diversify their income. For example, they kidnap rivals, informants and incompetent subordinates to punish, exact revenge or send a message. Now that they have seen that people are willing to pay heavy ransoms, kidnapping has become their second-most-lucrative venture, with the targets ranging from businessmen to migrants. Another new source of cartel revenue is oil theft, long a problem for the Mexican government. The national oil company, Pemex, loses hundreds of millions of dollars’ worth of petroleum every year to bandits and criminal gangs who tap into pipelines and siphon it off. Cartels are also moving into the market in pirated goods in Latin America. The market used to be dominated by terrorist groups like Hezbollah and Hamas. Cartels are also moving into extortion. A cartel representative will approach the owner of a business — whether a pharmacy or a taco stand — demanding a monthly stipend for “protection.” If those payments aren’t made on time, the business is often burned to the ground, or the owner is threatened, kidnapped or killed. Better yet you could add small amounts of arsenic to increase the “positive” effect. It’s hard to tell if you are trying to imitate or parody Swift, but either way, you are doing it badly. “The Rise of Artificial Sweeteners”. So Steven Kopis admits Diet Coke is a problem. Good to know! It’s worse than that. Personally, I don’t know if artificial sweeteners are a problem, but I would not at all be surprised. But consider this: We — both Menzie on the left and I on the right — think that obesity is a problem. And that is a widely shared view across the ideological spectrum. So where is the related research? Not a whole lot pops up on Google. If I were the God of Public Policy, I would have a robust effort in understanding age, income, class, race, physical activity, eating habits, and health. I don’t see that, not under Trump, not under Obama, or any other president for that matter. Obesity, as Menzie implies, is conservative policy. Intervening in someone else’s eating habits is undeniably paternal (or more likely, maternal) and suggests that individuals cannot be entirely relied up to make good choices with respect to food. Many a wife would agree with that notion, I would think. Thus, this kind of policy much more easily fits with a conservative government, ostensibly one like the Trump administration (is it actually conservative?). Now, why would conservatives resist more research on this topic? And this brings us to soda taxes, Wisconsin and climate change. Conservatives fear that the mere examination of a policy issue will create a rent-seeking, egalitarian lobby which will capture the topic and create more pressure for regulation and taxation, regardless of the merits of policy. Menzie’s shot at soda taxes is a good example of a regulatory bias in the absence of compelling data. Menzie’s obsession (let me return the favor) with Wisconsin is another example, where a middle of the road reader cannot but help feel that ideology is driving both the choice of topic and the analytics involved. The conclusion is driving the analysis. And no topic has done more to discredit science and policy than the unbridled hysteria surrounding climate change. I doubt I could count the number of conditional news stories camping on the front page of the New York Times. New York will sink; Miami will sink; there will be more hurricanes, more tornadoes, more droughts–and the climate refugees! All of this news is conditional: will, could, might. Check the statistics, and you’ll find that nothing has actually happened in most cases. The implications for the politico-academic complex are just absolutely damning. You can either play on the field or be a ref, but if you do both, the audience will think you’re cheating. And that’s where we get when scientist or scientific organizations like NASA becomes advocates for policy. And this is even more true for the likes of Jim Hansen (former head of NASA GISS, their temperature measurements) and even Roy Spencer of UAH. If you’re going to provide the numbers, stay the hell away from advocacy. As a consequence, conservatives find themselves either embracing ignorance on policy issues or risking opening Pandora’s box and allowing ideology-led, politicized analysis to drive policy-making. It’s an ugly choice. So, to return to my main point, I personally think that we need a much closer policy look at what we’ve been eating and doing, but I can’t allay the fears of my conservative friends that doing so will just lead to something like Philadelphia’s mindless soda tax. If the folks posting to this blog thread are genuinely worried about the health of their fellow citizens, then why not crank up the excise taxes on gasoline and diesel fuel? The USA enjoys (sic) the lowest excise taxes on dirty fossil fuels in the rich OECD country club. The USA also enjoys high obesity rates and shoddy health outcomes. A few years ago, the USA invaded and occupied Iraq with a view to securing the cheap energy entitlement. One could argue that the USA invaded Iraq and Afghanistan to shore up the American reputation as a world class, great terrorist power. But the reputation appears to make Americans feel less secure, not more secure, as Americans lovingly grandfathered Da’esh. In addition, financing a reputation for terrorism costs a bundle, the kind of money that only a Neo-Marxist in the Baran-Sweezy tradition could appreciate. North Americans ought to use automobiles less, not more. Highly subsidized electric vehicles are not the answer. Nordic-style excise taxes on dirty fossil fuels are the answer. Erik, it takes energy to produce GDP. The U.S. fracking boom added to global GDP, ceteris paribus. Blacks and Hispanics in the U.S. have higher obesity rates than whites and Asians. The health outcomes of blacks are lower, and there are differences between countries how infant mortality rates are measured, along with other different factors (which I explained to you before, but you chose to remain ignorant). If it wasn’t for the U.S. and its military power, the world would be much worse. Americans love the independence of cars rather than depending on mass transit, and cars pollute far less compared to the 1970s. The tax can be regressive though the estpoor do not own automobiles and are to some extent shielded from Pigovian taxes on fuel is using public transit. In terms of a cheap-energy lifestyle leading to poor health, the poor rank highly. If higher fuel taxes provide incentives to the poor to self-propel like educated professionals and other elitists do by commuting to work on a bicycle, for example, then I would call that a win. In my view you are severely underestimating the negative impact of relatively inexpensive automobile fuel: on urban sprawl, on health outcomes, on national security budgets, etc. Americans as a collective would benefit greatly by spending less time in automobiles. As the new buzz expression goes, ‘Sitting is the new tobacco’. Da’esh/ISIS/ISIL and all the misery it spawned are blowback from the USA focusing on the Mid-East production side of the cheap energy entitlement when it would be much more cost effective to address the problem on the demand side of the equation. Incidentally, do you recall how American motorists were caught offside during and after the first OPEC oil embargo? Less so others, as they were already piloting smaller, more fuel efficient vehicles in response to higher real fuel prices. Most of the US economic recessions in the post-war period were immediately preceded by spikes in real oil prices. Nordic-level excise taxes would remove much of the volatility from perceived fuel prices and eliminate the potential for an oil price spike to catalyze a recession. It comes down to cost/benefit, Erik. Increasing fuel taxes, ceteris paribus, does not increase welfare. Just the opposite, particularly in the lower income groups. Once again, this kind of tax is highly regressive. Steven Kopits: I think you’ve missed the entire point about externalities. If there are negative externalities, then welfare might indeed rise with taxes. Who suffers the most from, for instance, pollution by living by freeways, roads, or close to dumps? Gee, I suspect low income people. You would want to consider incidence of negative externality as well as tax simultaneously. You’ve just assumed the answer you wanted. Increased fuel taxes hit low income commuters particularly hard. See, for example, slide 8 of Don Pickrell’s presentation to the EIA. Although the presentation is some years old now, it strongly suggests that the lower two quartiles are disproportionately affected by rising gasoline prices. The bigger externality is of the people living next to the highway on drivers. On I-95 between NY and Boston, drivers are probably losing on the order of 100,000 hours / day to congestion. I wouldn’t be surprised if the externalities of people failing to relinquish their properties to I-95 road expansion on the order of $1 billion per year — just on the NY-Boston stretch. Steve Kopits: You mean a report of the Koch Foundation funded organization, allied with ALEC, and member of the State Policy Network. Excuse me if I am not entirely convinced. I thought the report was pushing too hard as well. But it’s a source. Baghdad Bob was a source as well. I suppose his reports should have been taken just as seriously? Having a “source” that you know is biased is not really a source, if one is after truth. steven, what you are saying is wrong data is better than no data. poor position to take. Personally, I thought the analysis was a pretty good summary. I’ve no doubt that high soda taxes will push some towards beer in some cases. However, beer is really not fully fungible with soda, ie, you’re not going to give it to the kids with their sandwiches. So, yes, the point is taken, but I am skeptical that the behavioral implications are quite as dire as the bullet point would make it seem. To the best of my knowledge, the program was always intended to pay for parks as well. The 20% going to public pensions and the like, well, that’s no surprise, and it won’t be a surprise if that share rises. These were my specific critiques, at least of what I read. Otherwise, I think the report contains much useful information and qualifies as a legitimate source of information on the topic. That’s why I linked it. Social benefits from the tax? Do you mean that it is beneficial to make beer, which is now cheaper than soda, the beverage of choice for many people? Where is that on the chart?